A taxi firm charges per mile plus a fixed charge of . Write down a formula for the cost of hiring this taxi to travel miles. It costs to travel mile. It costs to travel miles. So travelling for miles will cost . A rectangle has a width of and a length of . Write down a formula for the perimeter in terms of . 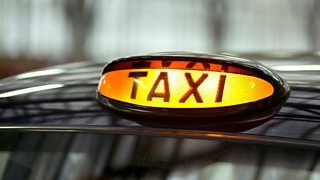 To find the cost of the taxi for a journey of miles, replace with . The formula for finding the circumference of a circle is . So it is easy to find the circumference if we know the radius. What happens, though, if we know the circumference but want to know the radius? In this case we can rearrange to make r the subject of the formula. Rearrange the formula to make the subject. We may know the area of a circle and be required to find the radius. To do this, we can rearrange the formula to make the radius the subject. We will now rearrange the formula to make the subject. Start by dividing both sides by . Then take the square root of both sides. A circular pond is surrounded by a square lawn. This triangle and rectangle have equal perimeters.